An analysis of the Central Netherlands Temperature record | Watts Up With That? Fig 1 The Dutch population do not have access to their raw temperature data before 1951 for the area of their country marked red. Instead the KNMI has decided only to make available their “CNT”, the Central Netherland Temperature index. KNMI do make two coastal temperature series available before 1951 (Vlissingen and De Kooy) and then some strongly adjusted temperature series (De Bilt and Maastricht). Finally the Northern Eelde Station that has not been adjusted has been made publically available, fortunately. Before 1950 close to one full Kelvin of heat has been taken out of data. The strong dive in temperature 1950 has been removed. Exactly the same occurs for the De Bilt station, the temperature dive in 1950 has been removed. Here the combined adjustments of Maastricht and De Bilt data. The “Central Netherlands Temperature” index is shown here too. It is almost identical to the adjusted De Bilt and Maastricht data. It does seem that the other Bruxelles station “Bruxelles National” has less warm trend than the Uccle station, suggesting a little UHI in the Uccle dataset? Let’s move on, the Luxemburg station is available from Crutem3, and the dive in temperature from the late 1940´ies to 1956 yet again is confirmed. Imagine that KNMI was correct in their adjustments and just by coincidence we have De Bilt, Maastricht, Uccle and Luxemburg showing a HUGE freak error simultaneously in 1950. Would it take a miracle at this point for KNMI to be correct? From GHCN we have Frankfurt-Wiesbaden temperature data again the warmer pre-1950 data are confirmed. In addition the warm peak 1957-62 is stronger in central Germany. In my previous article on this matter I analysed a row of German stations from raw GHCN V2, check link in the end of the article. The Ypenburg station is around 10 km from the coast. The “choice” of years available from Ypenburg is perfect: We have once again confirmed the large dive in temperatures 1949-1956 in Southern Holland. How about Paris data? They must be available? For some reason NO raw temperature data is available before 1951 from all Northern France. But Paris then? Obviously we should expect some UHI for a Paris station, but none the less, the Paris Orly data – (although not showing 1956) do confirm the warmer pre 1950 temperatures compared to the 1970-80 level. Also Paris do not support KNMI and their “CNT”. When I first looked at Paris “raw” GHCN data I was surprised because the year 1949 showed a large temperature dive unlike the other stations in the area. However, the 1949-dive in GHCN Paris L Bourget was contradicted not only by all other stations in the area, but also by the other Paris dataset, Paris Orly, here taken from Tutiempo. Thus, all Northern French raw data are eliminated in GHCN before I 1951, and then the only dataset with a 1949 peak happens to have the data point lowered 2 K.
Before returning to the Netherlands, Finally one more German station from raw GHCN V2, Dresden (for more German and Czhech stations, see the link 2 in the end of the article). This is how KNMI illustrates the corrections done to the Gemert station. They compare to a reference dataset I believe is not public, but that is likely to resemble the CNT. the reference stations Oudenbosch, De Bilt and Winterswijk. So, the increasing divergence 1906-1950 with (already adjusted!) De Bilt and more is due to plant growth, and the change 1949-50 is then due to re-instalment, KNMI says. Same scenario, this time its Uccle divergence from the KNMI “homogenized” De Bilt data set. So the Uccle increase in divergence 1906-1950 to the “homogenized” KNMI De Bilt data is also plant growth then? And also a re-instalment in 1949-50 in Bruxelles, perhaps? But the increase in divergence is even faster 1880-1906 – So plants grew even faster before 1906? Fig 16. From figure 5 of . 1) Its definitely possible that I misunderstand this figure, but as I understand, it shows the divergence between individual stations and then a reference trend based on data from Netherlands? If so, how come al stations show a positive divergence 1940-50? Should a valid reference not be made so that it resembled actual temperatures of Netherlands as much as possible? 2) The Maastricht and De Bilt stations only differ from this reference with around 0,15 K.
As the difference between raw Maastricht/De Bilt versus CNT is around 10 times as much, this suggests that this figure actually show divergence between a reference and already ADJUSTED temperature sets. I’m not sure what scientific value this has. 3) The Eelde divergence is shown lower than the De Kooy divergence. As we will see later, Eelde is roughly 0,5K warmer than for De Kooy before 1950. So how come they can show De Kooy with a warmer divergence than Eelde? Again it seems that several data sets have been adjusted before showing divergences in the above illustration. One more note: The illustration do not show data points for Leeuwarden 1949-55? Many Tutiempo temperature series I have been able to test against raw data appear to be warm adjusted. But the point here of mentioning Leeuwarden none the less is that we from Tutiempo learn that this data set do exist at least from 1949. So, why did KNMI only use data from 1955 in their illustration? In Northern Holland we also have the KNMI data for Eelde and it can be proven unadjusted against NACD V1. Eelde data resembles Leeuwarden data from Tutiempo, and thus the Tutiempo Leeuwarden dataset also appear unadjusted. In comparison with the previously shown apparently raw datasets, this Northern region with the Eelde and Leeuwarden stations appears to have had a slightly colder period 1930-50 but still around 0,5-0,6 K warmer than the “CNT”. Coastal temperature stations of the Netherlands. When examining data we know is raw (or have a reason to believe is raw), then only the coastal stations Vlissingen and De Kooy show similarity with the “CNT” temperature trend before 1950. CNT appear to be the “Coastal Netherlands Temperatures” rather than the “Central Netherlands temperatures”. We can now estimate coastal and Non-coastal temperature trends for Benelux based on coastal stations De Kooy and Vlissingen and non-coastal stations Uccle, Luxemburg Airport, Eelde, Maastricht and De Bilt. All are raw datasets. Obviously stations Uccle and Maastricht are likely to include some urban heat. Yes, here and there I cannot be 100% sure which stations are adjusted and which are not. The issue here is that raw data from KNMI is not just freely available, that would be a lot easier. But since this is not the case, I find it better to try to give the best estimate possible. The distance ocean air influence over land is illustrated her for SW Jutland . Most of the ocean effect disappears just around 5 km from the coast (depending on topography also). Therefore the poorest stations to use for land temperature estimation are the coastal stations. However, many hundred kilometres from the coast, still the coastal trends can dominate temperatures on hills and mountains, and sometimes valley stations just downstream from larger mountains. 3 More on Coastal temperatures. I think an analysis of my hometown (village) up in the Jura mountains would be interesting for the population of the world, will you do it? The name of the place : Le Lac des Rouges Truites, France. It is as good a proxy as your little province of the Netherlands. Temperature data, like fine shellfish, are best enjoyed raw. We got to get it down to just a few words. Don’t bring a treatise or dissertation when 30 words would be better. Indeed, in some cases, the very (long) length of skeptic arguments can be used against it. Why do the skeptics need so many words? What are they hiding? I can’t make heads or tails of what they’re saying…. look at Venus. There are subsidiary points (credibility & deceptions & ideological motivations of the warmists, sea & ice levels etc) that should be attacked separately, but we have 2 main debunking points to keep in mind, to kind of refer back to sometimes when “digressing” into extended verbiage. 1. There’s nothing wrong with the climate. It’s that simple. The fabricated hockey stick has been debunked; there is nothing at all unusual about temps, or the rates of recent temp change. I thought the Dutch were chocolate experts, but for KNMI – Koninklijk Nederlands Meteorologisch Instituut, it looks like ‘fudge’ may be their true calling. read the papers on uccle. also you cannot compare raw absolute temperatures unless you correct for altitude differences and latitude differences in stations since both latitude and altitude explain a majority of the variance in temperature between stations. WRT coastal stations you must stake care there as well since the predominant effect is a narrowing of the standard deviation at least up to 50km from the ocean. beyond that range the sd increases.. generally speaking. There used to be a commentator named R. R. Kampen (IIRC) on WUWT who worked for the Dutch Metoffice. Maybe his email can be dug out and maybe he would comment on this? Don’t bring a treatise or dissertation when 30 words would be better. Here we go. The idea, that back/trapped radiation can significantly warm the surface was debunked by professor R.W.Wood in 1909: http://www.wmconnolley.org.uk/sci/wood_rw.1909.html . This is they reason, why older people were not taught the “greenhouse effect” at schools, although the hypothesis is 150 years old. Britain is colder than winter as the country faces a late spring washout weekend – as it emerged parts of the Arctic and Antarctic are warmer than Britain. I had to pay $50 US to get the RAW DATA for the Chanhassen MN station. I’m still P-O’d over this. My grandparents paid for it, my parents paid for it, I paid for it. I don’t have the time to “tilt at windmills”. If I did, I’d be suing the NOAA under FOI to get all the RAW DATA MADE PUBLIC. WHAT A SCAM! What proof that NOAA is HIDING INFORMATION THEY DON’T WANT US TO HAVE! Regarless of the latitude, longitude and altitude, the long-term trend in raw temperature for each of the different stations should be similar. The long-term trend for each station should also be similar to that of the regional temperature index. The combined effect of altitude and latitude is to warm or cool the entire temperature history of one site relative to another. The first difference between two sites (or between one site and the regional index) should be approximately constant over time unless there is some other factor such as UHI, which would give as gradual change rather than an abrupt one. We do not see that in the sites discussed above. In the case of the stations and index under discussion by Frank Lasner there is a common change point around 1950. The past seems to have been made colder by an abrupt adjustment to the older part of the data. The reason for this needs to be explained. In the early 1950s, the East Flevoland Polder was drained, 56,000 hectares of water became land. De Bilt, for example, became twice as far inland as previously. Any summer – winter divergence at that time? you cannot compare raw absolute temperatures unless you correct for altitude differences and latitude differences in stations since both latitude and altitude explain a majority of the variance in temperature between stations. Steve, that’s only if you want to compare or combine absolute temperatures. The raw data is fine for observing changes in temperature over time, like the big 1950 temperature drop that Frank is focused on. Its presence in pretty much all raw temperature records (except a few that are highly moderated by proximity to the ocean) show that it really happened and should be represented in the combined record. Recommend one subject to study: IR Spectroscopy. Please note which molecules this involves. No valid arguments, I am not surprised. In all seriousness, there is a missing plot in this fine(!) document. There are a bunch of wiggles with various adjustments. Let’s see a plot that just combines the adjustments. It ought to be a set of overlapping step functions of different plateaus and smooth slopes. From what we’ve seen, many of them change right at 1950. I like to hear a good reason for that. @Harold Ambler. “Temperature data, like fine shellfish, are best enjoyed raw.” Love that comment. So appropriate, already a classic! Great, though that particular passage per your link could use some cleaning up, modern rewording. In ads or presentations, we note a basic point, and give references to extensive rebuttal-resistant support for the claims. And what you reference in the link is a point of support that we keep in the arsenal, that we refer to, in making a foundational point: that at best all we have supporting CO2 as a significant greenhouse gas is an arguable and tentative theoretical model, NO evidence. Your point illustrates the scientific uncertainty with the theoretical model, the obvious lack of consensus, if you will. Others suggest CO2 only has an effect below 200ppm. There is also the issue of the missing tropospheric heat signature, and of the missing heat generally (it’s not at the bottom of the ocean!). As with your link, many contend that while CO2 has demonstrable effects in closed systems, the trace gas has no effect in the wide open atmospheric system. When the theoretical model is so uncertain and arguable, the (lack of) evidence must trump the sketchy model. Especially, I hasten to add, when the radical cap & trade type schemes that the leftists advocate call for up to 83% mandated CO2 cuts (this passed in the U.S. House in 2009), and would in effect take a wrecking ball to civilization as we know it. My contention, and this is consistent with the ultra-trace nature of this gas, is that much more weighty factors such as variation in the sun and ocean and atmosphere overwhelm any conceivable minimal effect of CO2. My analogy: imagine a big high school basketball gym / auditorium in freezing winter weather, with all its big doors kept wide open. And then take a tiny 800w bathroom heater, and run it continually inside the gym. Sure, the tiny heater, just like trace gas CO2, heats a little bit. But the little heater is overwhelmed by other factors, by the size and scope of the frigid environs surrounding the gym. It’s not going to change the temperature in the open auditorium by even the slightest. I think that the leftist politicos and econuts drummed up the whole theory to meet their specification. And since its inception, the theory has been supported by untold billions or trillions of $, and by an unquestioning MSM. Just as your link tells it… in the past, CO2 was dismissed as an ineffectual greenhouse gas. Why the change all of a sudden only when the leftist enviros came to the scene?? Most of Holland is not more than around 30m above sea level. The country spans 2 degrees of latitude. also you cannot compare raw absolute temperatures unless you correct for altitude differences and latitude differences in stations since both latitude and altitude explain a majority of the variance in temperature between stations. Perhaps not this time. Holland isn’t well known for it’s mountainous terrain. De Bilt altitude is around 5m, Maastricht 65m. I don’t think that justifies cooling them by 1K. Keeping some employees in De Bilt warm and well fed might. Why are coastal temperatures lower than inland temperatures in the earlier period, but not in the modern period? Air pollution from coal powered ships and coal warmed homes etc causing more coastal fogs in the earlier period? Another recent study in Holland showed improved visibility over the 1980-2000 period, allowing greater insolation at the surface. The minimum meteorological surface air temperatures in this region should track the Atlantic Ocean temperatures quite closely. The prevailing weather systems approach from the Atlantic Ocean. I checked in my data collection and there was a decrease in the Atlantic Multi-decadal Oscillation (AMO) from 0.407 C in Oct. 1955 to -0.243 C in June 1956. This is a drop of 0.65 C that is consistent with the measure weather station data. I am using the NOAA ‘long’ AMO data set. It may be better to use a local ocean temperature from another database. The difference in temperature between the minimum and maximum temperatures is an indication of the local solar heating effects. The monthly averages of the min. and delta temperatures can be quite revealing. The can show the ocean influence for example. The minimum meteorological surface air temperatures in this region should track the Atlantic Ocean temperatures quite closely. The prevailing weather systems approach from the Atlantic Ocean. I checked in my data collection and there was a decrease in the Atlantic Multi-decadal Oscillation (AMO) from +0.407 C in Oct. 1955 to -0.243 C in June 1956. This is a drop of 0.65 C that is consistent with the measured weather station data. I am using the NOAA ‘long’ AMO data set. It may be better to use a local ocean temperature from another database. The difference in temperature between the minimum and maximum temperatures is an indication of the local solar heating effects. The monthly averages of the min. and delta temperatures can be quite revealing. This can show the ocean influence for example. Please email me the Chanhassen data as I would like to see if there is a solar signal in it. In the atmosphere, IR-active molecules contribute more to dumping heat from the top than trapping it at the bottom. It’s all in the timing, Mosh; same old same old: lower the early readings, boost the later ones. If it’s too blatant, lose the early ones. On the BBC news this morning they were complaining that the cold wet April has reduced the numbers of wildlife. That’s pointer to what will happen in a cooler planet. I hope the IPCC are listening. This is what p*ss*s me off – they always go to real weather phenomena when they have to explain unseasonable cold, but now even ‘normal’ hot summer temperatures are global warming. As to the opening post – how many records around the world have been adjusted for this propaganda since, was it Salinger?, first began the process in New Zealand? Have these adjusted records completely compromised the historical data? What have we lost here, besides all the hundreds of years in some cases of dedicated work in the infant science? Very nice study again. You are on a real roll at present! I was dumbfounded when I read this. I see one of the long data sets was in Belgium so may have some relevance to the Dutch experience. Disappointed to see 1K referred to as heat, which is energy and typically measured in Joules. To not realise the difference between temperature and heat is inexcusable when writing a scientific article. Or am I misreading things? Well, while the station itself was very good, nice Stevenson screen and so on, but it was obviously placed to close to a building, a heavy used parking area and a recently built bicycle lane (the tunnel you can see on Google earth nearby was build after 2004 and changed the whole pathway). Also, the station was moved away in about 2010. My guess would be, that due to the heavy population density in The Netherlands most of the stations experienced some kind of UHI effect in the last 100 years! I would be very skeptical about all this data! Tallbloke, you ask howcome coastal temperatures trends are more warm trended than non-coastal. The divergence before 1950 coastal vs. non-coastal in the netherlands is not different from what se see in the rest of the world. Thats a good question, most “obvious” explanation would be that it takes longer time to heat up oceans than land. That is, the land warming 1920-50 was just much faster than the oceans could change temperature. Then later the warming appears not too fast for oceans to adjust. But this ispure speculation, of course. Locally in Denmark (and Holland) we have the obvious situation, that winds in warmer periods comes from NW or W. In Colder periods we have more wind from the East. This suggests that in the warm period 1920-50 in Denmark-Holland (from Morocco to Iceland) the coastal stations were prevented to rise too much to to constant stronger ocean buffering of temperatures on coasts. Therefore the coast thermometers are not that good to show heat. They certainly show something else than near by in-land stations. And I hope they drop these annual temperatures off the chart for 2012, its been f-f-f-f-freezing there. Flower show in April was nearly cancelled due a lack of flowers. Most trees did not open their leaves until May 7th. Very poor growing season all round. Silly me – this will be billed as the warmest year on record. Amazing what you can do with statistics. Mosher, to me it seems that you guys at BEST have tried to use math on a giant pile of rotten manipulated cherrypicked temperature data. What we saw in Holland is just business as usual. And why not the most UHI manipulated country in the world TURKEY! I have been a full time programer for 14 years in Novo Norrdic, so actually i can make a program. But only if data appear genuine!!! Oh, and Steven, you forgot to add the other law of adjustments. There – fixed that for you. Steve, if this was a true procedure for adjustment, then approximately half of the samples would have the historic temperatures being increased. But they never are, are they. If all adjustments are one way, thus creating a 20th century warming trend, then this is fraud. Give me one logical reason why all historic temperatures need cooling, rather than warming? It was taken in 1926, and it shows a relatively rural setting. Uccle (or Ukkel in Dutch) used to be a small suburb of Brussels (population 3.091 in 1815, 19.967 in 1903 and over 74.000 today — Population density 3,349/sq.km in 2008). Today -although on the outskirts of town- it is an integral part of Brussels, capital of Belgium and Europe. That plus the history of Arrhenius getting the wrong end of the stick in the first place.. The Shattered Greenhouse: How Simple Physics Demolishes the “Greenhouse Effect”. Arrhenius’ first error was to assume that greenhouses and hotboxes work as a radiation trap. Fourier explained quite clearly that such structures simply prevent the replenishment of the air inside, allowing it to reach much higher temperatures than are possible in circulating air (Fourier, 1824, translated by Burgess, 1837, p. 12; Fourier, 1827, p. 586). Yet, as we have seen in the previous quotation of Arrhenius, this fundamental misunderstanding of greenhouses is attributed by Arrhenius to Fourier. There you have it, Arrhenius’s garbage in garbage out because he didn’t understand what Fourier was saying, and then properly debunked by Wood. Arrhenius didn’t understand convection or the second law, he was just making up his own fisics. AGWScienceFiction fisics knows this history – it hides it. Just as it hides the Water Cycle and the direct Heat from the Sun in its comic cartoon energy budget. And created a “heat” most spontaneous! I was going to comment but TallBloke beat me to it. No hills for 400 Km and 100km of land below sea level. 1. One of the WETTEST Februarys across England & Wales. Using the EWP series, it ranks in the ‘top-5’ of such months. 1. A heavy SNOWFALL on the 25th and 26th in 1950 caused much damage in south east England, bringing down over a thousand telegraph poles and numerous trees. A clutch of what is thought to be three tornadoes, one of which did considerable damage, moved from the Wendover to Linslade area in the NW Home Counties. Much damage, with heavy rain and large hail. Smoke particles from large-scale forest fires in Alberta, Canada were blown across to NW Europe on strong upper-level winds and led to the widespread viewing of a very rare ‘blue moon’ event. The base of the pollutant cloud was around 12000 ft and the top circa 20000 to 25000 ft. In addition, the sun was coloured when it appeared through gaps in the cloud. Aircraft traversing the cloud were covered by an oily substance believed to be a resinous distillate from the burning wood. 1. Notably WET across England & Wales. Using the EWP series, just into the ‘top10’ of such-named months. So it looks like there was a heck of a lot of “cold and wet” in the neighborhood. Perhaps some Dutch speakers could do a similar search? So I think there is independent confirmation of a likely cold excursion, though more evidence is needed to assure it. Saying “nothing happened” seems quite wrong. The GHCN v2 raw data is not really “raw”, it is an monthly average of daily averages. Prior to 1950 only 3 daily measurements were sent from de Bilt to GHCN. These daily measurements were made at the hours 8, 14, and 19. So the lowest temperatures in the daily cycle (occuring during the night) were not sampled. After 1950, measurements for all 24 hours are sent from de Bilt to GHCN. Thus giving a much better representation of the daily cycle. That means that prior to 1950 the daily means in GHCN v2 are too high, compared to an average formed from a proper representation of the daily cycle. As a consequence of this, the GHCN v2 data prior to 1950 from de Bilt is not recommended for climatic analyses. Air pollution from coal powered ships and coal warmed homes etc causing more coastal fogs in the earlier period? Another recent study in Holland showed improved visibility over the 1980-2000 period, allowing greater insolation at the surface. I agree. Data from the UK show fog frequency fell from about 1950. And as I noted above the coast moved in parts of Holland by as much as 10 kms. There is also a strong seasonal effect from fog, summer cooling, but winter warming. A seasonal/diurnal breakdown of temperatures would tell us rather more than a gross average. “Look at Mars” – more CO2 than the Earth and much colder! GHCN V2 comes in a version adjusted and an unadjusted. Its true the even the raw version appears to have been fiddled with (Berlin Dalhem, Paris etc..) and certainly the GHCN unadjusted V2 is cherry-limited in data availabilty, but still its what we have available in public…. Welcome 😉 to the world of WattsUpWithThat SRJ, nice to see you here . Keep it up.. The GHCN temperature record has also been ‘got at’ for stations in the Arctic. A comparison of GHCNv2 against the GHCNv3 ‘revision’ reveals a shameless lowering of pre-1960 temperatures by 0.9C, and a shameless hike of 0.8C by the late 1960s. By fiddling the figures for Iceland and N. Russia a spurious 1.7C warming trend is conjured up. The guardians of this data need to be audited and maybe prosecuted. In conventional topiary one clips the leaves of shrubs such as box or privet into shapes of animals, birds or anything else. The same can clearly be done – albeit in a 1-dimensional line only – with the climate record. Perhaps a WUWT competition in climate topiary could be launched for the most compelling and artistic adjustment of the 20th century temperature record, to look like a leaping horse or Loch Ness monster etc. After 1950, measurements for all 24 hours are sent from de Bilt to GHCN. Thus giving a much better representation of the daily cycle. That means that prior to 1950 the daily means in GHCN v2 are too high. No.. any change in data could just as well result in a cold adjustmens as a warm adjustment. Besides, ITs not only GHCN raw V2 that has the original De Bilt. If this is a general Dutch issue why are not the coastal stations changed in 1950 like De bilt? And howcome the 1949-56 temperature dive are seen in the near by countries? And why are we not allowed to see any data (except strongly urban) for Belgium etc? Steve, I’m sure your argument has some merit, but we’ve seen this modus operandi many times before. “Real Climatologists” have”adjusted” yet another temperature index to cool the past and make current temperatures appear “unprecedented”. This is systematic, global fraud, plain and simple. If you have a rational explanation for these global temperature adjustments, let’s hear it. And sorry mates, there is no dive in 1950. The years 1950 and 1951 were meteorologically uninteresting in this area. Half of the Netherlands where flooded in 1953. Should have had some effect on the inland temps. You did notice that the explanation for changing data in Gemert was quite different than the story you got? But all accross Holland, Belgium, Luxemburg, Germany, France, Denmark the temperature drop around 1947-56 is wrong, but for different simulktaneous events? We also have the old DDR represented, I guess they co-worked with Holland measuring city temperatures in 1950 ? @ Philip Bradley: absolutely valid remark about the influence the Flevopolders may have on the climate, causing De Bilt to be effectively further away from water. Technically speaking not from the sea, as the former Zuiderzee (“south sea”) had already become a large sweetwater lake since the closure of de Afsluitdijk in 1932. Nevertheless, de Flevopolders added substantial land surface. But the Flevopolders only became dry in 1957 (Oostelijk Flevoland, easterly part) and 1968 (Zuidelijk Flevoland, southerly part) respectively. I happen to live in the easterly part (Lelystad), 4 meters below the sea level. Lelystad by the way set a record low temparture this winter beginning of February at minus 22,9 celsius. It was the lowest temperature recorded for the last 27 years in the Netherlands. Of course this doesn’t say much about averages and trends, but at least this “children won’t know what snow is” and “we won’t ever be able to iceskate outside anymore” has been thoroughly debunked. It is also encouraging and funny that the large public has remembered these claims and many now deride them. @Atomic Hairdryer: altitude is largely irrelevant in the Netherlands, with the exception of Maastricht. General remark: the people at KNMI are (unfortunately) known as fierce warmists. Luckily we have some other voices as well in the Netherlands such as climategate.nl and scientist Mr Bas van Geel. Is there anywhere where temperature data hasn’t been scammed in one way or another ? This rings some bells – we’ve discussed some of these issues before. In a thread 2,5 years ago, Hans Erren told me that “The 1950 step is a well known WMO artifact”. I’m still not sure what this artifact actually is – change in measurements standards? Anthony, do you know? Or maybe Hans will show up and explain? I am planning to make an example using the hourly data for de Bilt from KNMI’s homepage. I do not think this is a general dutch issue since it is only described for de Bilt in the article by G. van der Schrier. But it is an issue for de Bilt, and it is introducing a warm bias and therefore, data from GHCN v2 for de Bilt is not representing the correct de Bilt temperature. Start dates are later than 1950 excpet for coastal stations and the strongly adjusted De Bilt and Maastricht. Only Eelde – exactly as said in the article – in the North of Holland is RAW an UNADJUSTED available before 1951, and as shown Eelde do have 0,5 K more dive after 1949 than the CNT. It is exactly as I say: There are no RAW temperature data available for the Dutch people before 1950 except for coastal stations and Eelde. See the first figure in the article. Thankyou so much, I will check it out from A ti Z. > and altitude explain a majority of the variance in temperature between stations. This is fair enough if you’re trying to determine the temperature at one particular place that’s at a different position than one of your thermometers. be averaged to get a true, unbiased result. This is more true than you might realise. The non-coastal drop from the 1930-50 level to the 1960-80 level can be traced basically from Morocco to Russia. its only THE SHAPE of data that differs a little , but the KNMI´s Rambo-like data changes removes the whole trend difference 1930-50 versus 1960 that is evident also From Ireland to Isreal!! I’m sorry, I’m Dutch and into the met as of over thirty years. I know more than three centuries of climate and climate history in this country practically by heart and I know it utterly, not only by raw data but by all those factors influenced by weather and climate conditions. One remark to be made: where you measure in this country is not too relevant. It is flat and it is very small. A trend in Maastricht (my birth city by the way) will be found likewise, with at most a couple of tenths of degrees difference, everywhere in the country. Recent warming by the way was strongest by that small margin in the far northeast of the country, which has neither urbanized nor seen land win over de past half to whole century. The data voor de Bilt, and Zwanenburg if you wish to go back a while, suffice. By the way, Eelde/Groningen is not coastal like De Kooy is (for a meteorological reason). Also, there are more numbers, e.g. http://www.knmi.nl/klimatologie/daggegevens/antieke_wrn/index.html . Those who like to try and find out whether meteo-wise the years 1950 or 1951 were anything special, as compared to e.g. 1947, 1956, 1963 or 1979, should take a Sunday afternoon to leaf through an archive like this: http://www.wetterzentrale.de/topkarten/fsreaeur.html . Frank Lansner at 5:12 am, why not show now? I could go on, but I think you get my drift. The problem is that using this adjusted data leaves ‘sceptics’ playing off the back foot (“Look at GISS/CRU etc. graph! Now the World is warming up again”). The more adjustments, the futher sceptics are being painted into a corner! How can sceptics argue that the world is cooling while ‘climate science’ is shifting the goal posts all over the place (more precisely to where it’s warmer). The answer is that the sceptic movement must completely cut its ties with the manipulated graphs of the (quote) charlatans. A completely new, true, uncontaminated data set for Global Temperatures must be produced by trustworthy people. Legitimate adjustments can be made to the raw data, of course. This website has proven that there are more than enough absolute amateurs who are up to the task. Frank L. appears a likely candidate; Steve “the hero of the 21st century” McI., too. Let’s face it, sceptics are on a hiding to nothing at the moment. There’s a desperate need for some proper graphs which go the right way. How’s about starting with Global Temps from the late 1800’s, then a proper graph of the satellite record. If everything goes well, move on to Sea Ice and the other manipulated graphs…. The Bilt was replaced in 1950. It cooled the record by 1 C. It explaines the 1950 dip in raw data, but it does not explain the other stations. Im happy we agree on this. One thing i would like to mention though: KNMI suddenly 60 years after 1950 assumes that a local station move on flat ground should make a huge difference of 1 K, but given that other stations show a similar drop in 1950, it appears someone assumed wrong for De Bilt. It takes a miracle that so many station simultaneously by freak error ends up with the very same freak “wrong” data graph. I hope all can see this. On top of this, KNMI seem to hide raw data, and this obviously do not make them look good or trustworthy in any way. At least thats my opinion. The Royal Netherland MI should openly share raw data from many many temperature stations with the Royal Netherland population. If you have Raw Zwanenberg or any other dataset (from Europe or beyond) mail me on fel@nnit.com, thank you. – especially If you have 30 years in the Met world, please send me raw data also from Belgium (That is EVEN MORE RESTRICTED when it comes to temperature data before 1951 than KNMI !!) please let me see it. What is it w/Mosher on the lat/altitude stuff? If you’re working w/anomalies at single, unchanging stations, you don’t need to worry about it — anomalies are anomalies. If you’re talking about single stations changing location, then yes. But then why not treat changing station locations as separate, unique stations? Yes, you cant examine temperature before knowing which data are sick and which are good. I am in the process of starting up such a temperature index “RUTI”, and even though im not there yet, RUTI is build on open dicisions and data sources, that is, RUTI is in fact the only nearly reproducable temperature set that exists at this moment. Possibly off-thread, but vaguely linked to this curiosity, possibly via “coastal” versus “inland” issues. Over the last 160 years the air temperature shows a sort of cyclic change with an amplitude of half a kelvin and period of eighty years but I don’t know why. Any ideas? The article already write: “Gemert had a large break in October 1949, when the station was renovated.” In the meta data on De Bilt, I found that there was a change from a Pagode Screen to a Stevenson screen in Mai 1950. The renovation in Gemert may have been a similar update. This screen change may well explain the artificial drop in temperature in 1950, which needs to be corrected to be able to compute a reliable temperature trend. At the time they probably thought that an open bottom was good for ventilation. In other countries similar screens with an open bottom were used as well, such as the Wild Screen in many Northern and Eastern European countries and the Montsouri Screen in Southern Europe. On sunny days with little wind, the land surface heats up, the heat radiation heats the thermometer (radiation error), which biases the measurement. Therefore Stevenson Screens (Cotton Region shelters) were used more and more, which are closed to all sides and use double Louvre walls. The difference between these two screens can be studied by making several years of measurements with both screens at the same location (parallel measurements). Many inhomogeneities are random in sign. But the transition of screens with an open bottom to Stevenson screens occurred world-wide. If you go back even further in time, to the 19th century, temperature was typically measured at the north side of a building, near a window of an unheated room. Even if the room was unheated, this still also created a warm bias. As these transitions in how temperature was measured occurred world-wide, they are seen in all the raw data and homogenization of the data will correct the too warm values to the cooler values that would have been measured, had people used Stevenson screens at the time. By the way, in Eelde they had a Stevenson screen from the start. This may be the reason that the KNMI is willing to give out this raw data. As this series is relatively homogeneous, it cannot be so easily abused by climate sceptics to mislead uninformed citizens. Which book was that? And is there any chance you can remember the exact quote? Here is a long term composite graph using, averaged anomalies (1960-1990 base period) including the Debilt, Central England, Upsalla & Berlin-Tempelhof data. These were selected, because they had records starting prior to 1750. Three filter methods were used, with a 20 yr. ( 0.05 cyc/yr) “cut off”. What is interesting, is that there seemed to little warming, in Europe in the beginning of the industrial age, and it was only after 1960, that the temperature “somehow” started to rise. Here are a couple more. Ave1 is the CEL data using a Fourier 0.05 cyc/yr filter, while Ave14 uses stations that started recording prior to 1800. What was interesting about the Ave14, was that it showed the 1850 era was a local low point in temperature, & by coincidence, the starting point for the HadCRUT data sets. the problem is that if you go and look before 1970 you are running into a problem. but before that they had to have people doing the readings of the temperatures every so often. but average temps. before is a definite no-no – everything become questionable and open to doubt. People doing the reading of temps. is definitely a very an unreliable source. If you go to this link you can find a developing conversation about this and the book name (I think). Manny thanks to Frank who is laboring to present this to us in a language not his own. ‘The instrumental records we examined seemed to be showing warmer temperatures than our computer models indicate should have ocurred. We have therefore adjusted the instrumental record.’…..
Tony, if you have the time to actually dig out the quote and give it to use including page and title, that would be great. We know the temperatures are adjusted by the Climate Scientists who then lose the adjustments and never really tell us WHY. ” My particular interest in getting hold of original temperature readings from these associations is to try to unravel a mystery. As you know I collect historic temperature records on my website, and I currently have two books on early temperatures that I borrowed from the Met office library, by Phil Jones and D Camuffo. So the actual phrase ‘warm bias’ was obviously used by Jones?camuffo and the reasons for the adjustments directly paraphrased by me. I did a google and came across this intriguing document. I just saw your note after I replied to TonyG.I’ll have a hunt around for the quote but I suspect it was in the biook I’ve since returned to the library and as it was a very long and somewhat tedious book I’d be reluctant to have to plough through it all again unless it was considered VERY important!! …..If all adjustments are one way, thus creating a 20th century warming trend, then this is fraud. Give me one logical reason why all historic temperatures need cooling, rather than warming? I will give you two. MONEY and POWER. You have to scare the (selfsnip) out of people to get them to give up money and power. Just how much money would Greenpeace, Sierra Club, WWF (now international political forces) or politicians/bureaucrats be able to extract from the general population with out a boogie-man to fight? Benbecula data, Wow, can you guide me on BEST data retrieval? How do i get yearly data? Thankyou so much indeed and keep bringing stuff, its very appreciated!! The Berlin Tempelhof is strongly adjusted even in GHCN v2 raw, CET is yet another fairytale on adjusted temperature data just like De Bilt. Thus your long term graph is based mostly on warm adjusted data, im sorry to say. Science is not science these days. Let me make it clear that I thought the Jones/Camuffo et al work was very well done but it became extremely theoretical and full of assumptions and conjectures and it started to occur to me part way through that there seemed to be an intention to modify the historic temperatures downwards. This precipitated my series of emails to a variety of people in order to try to determine if that could possibly be true. I was researching material for an article on the Mannheim palatine and the Jones book and Bohm study was ultimately a blind alley as far as my own interests at the time were concerned..
R. R. Kampen worked for the Dutch met office. This is not so. I am him, my background is academic meteorology/oceanography/climatology and mathematics for the love of chaotic dynamical systems (so I’ve enjoyed colleges from Henk Tennekes on fluid dynamics and some). I keep up with the subject but am paid for QA in a software company. …As these transitions in how temperature was measured occurred world-wide, they are seen in all the raw data and homogenization of the data will correct the too warm values to the cooler values that would have been measured, had people used Stevenson screens at the time….. The stevenson screens are nothing to write home about either. However the method that should be used for these problems is to show ERROR BARS! Instead climate scientists have the unmitigated gall to try to tell us they can measure the change in a century of dubious data to the nearest hundredth of a degree or whatever. Probably good work but waaaaaaay too many lines on the graphs. Keep it down to 2! Figuur 3, scroll 90% down, shows your jump. Sorry the text is in Dutch, I know of no translation yet. My way of opening these data is to change extension of the files, .dat, into .csv then open with Excel en bring data to columns. Unhappily I cannot help you as quickly as you could help yourself to Belgian data. Of them, like of many other places in the world, I merely know aggregated data known as ‘climate’, plus some historical incidents. I was using the “preliminary” data in 2011 rather than whatever they released in 2012, which I presume is in the same format but tidied up and packaged into several different editions rather than the single 2011 edition. It comes as about one gigabyte of text files in a simple but extremely verbose format (one temperature reading per line of several dozen characters). I had to write some short but geeky special-purpose software tools (mainly filtering, ordering, sorting, graphing, database) to preprocess them to get the data into a form accessible to general purpose display tools. You won’t get far with Notepad! I had intended to get the tools perfected ready for the full release earlier this year but lost motivation at the thought of fitting 44,000 fragments of pottery into a coherent vase without their being any agreed instruction manual and diagram with the kit, merely BEST’s artist’s impression. My favourite station was Hohenpeissenberg ( at http://i44.tinypic.com/1ynw5k.jpg ), followed by Berlin ( at http://i51.tinypic.com/2a82agl.jpg ), but this is just for fun without scientific value! Overall, BEST data would appeal to butterfly collectors more than engineers: mostly it’s a lot of short-time span records (frequently highly movable polar research stations for a year or two, or seasonally populated seafood processing stations), or longer ones with huge gaps, plus some fun ones going back into the 1700s. It would take years to sort out the station histories. Hi “TA”, sadly the Rimfrost site is for warm adjusted data in cherrypicked periods only. But thankyu very much for the tip! I see the book referred to by tonyb is available for a modest 133.70 euros. A bargain, since a CD-ROM is included with the adjusted data. I borrowed the book from the Met office library. Its very highly technical so only worth the money to those able to decipher the data and have a high boredom threshold.I had to renew it three times in order to plough through to the end. Thank you for links ! I disagree with Frank Lansner that KNMI fudged the data. My own homogeneity adjustment of Uccle and De Bilt which is referenced above, show that both Uccle and De Bilt have a synchronous station adjustment due transition to Stevenson huts. A Maastricht airport didn’t exist prior to 1945 so I don’t know where the early Maastricht temperature observations were obtained and when the observations on the current Ulestraten site did start, after the installation of a Stephenson hut in 1950 sounds very plausible to me. Hans, it puzzles me that I have now seen 3 different explanation that should justify the De Bilt correction, you focus a transation to Stevenson screen. When was the shift to Stevenson screen first documented? Do you have the original paper on this from 1950? Howcome you can be sure that such a shift should yield 1 K in warm adjustment? As shown, we also have large dives in Paris, Luxemburg, Frankfurt and Wiesbaden, Leeuwarden, Gemert and a rather large dive in Eelde too. In addition, the De Bilt correction has the effect that the level 1930-50 ends up almost as cold as 1960-80. This is not supported either from a row of German cities in GHCN V2 raw. Southern Sweeden shows the dive 1949-1956 to be almost 3 K, just like De Bilt. Netherland is surrounded by areas not in compliance with CNT when using raw data. So small Netherlands climate is rather independent of its surroundings? And most of all: What would be your explanation for howcome KNMI dont make all temperature data pubplic available? And why do Belgium only have data for the Bruxelles area public avaiable? Howcome northern France has no raw data before 1951 publically available except paris? Howcome Germany dont show many raw pre-1951 datasets? Howcome Denmark – Exactly like Holland – only show data from coastal areas except Copenhagen, the UhI poluted station? Howcome Poland demands 20.000 Eur to deliver me 50 years from one station when asked? There are more old raw GHCN V2 data available from Zambia than Nothern France + Benelux + Northern Germany combined. If this causes disbelief, who is to blame for that? Format looks OK. Temperatures look silly. THE TEMPERATURE might not be what you think it is. Check the file header and site_details.txt or whatever. Watch out for seasonal adjustments and similar warnings about how this average has been calculated and adjusted. Smoke, fire, and all that. Once in a blue moon, coincidence. These things are happening all over the world. I have come to have *zero* believability in what the Statists tell us, whether it’s in climate, economics, politics, or any other field. People need to wake up to what this crowd wants, and what the end terms are for we regular folk. Apologize for the rant, but I’ve seen too much of this in this field, and too many others. Feel free to snip, but I truly hope that people in America, Europe, and the rest of the world wake up to the threats that are upon us. Many thanks to Anthony, among a goodly number of others in the New Media, who are doing their part to push back the tide. If you want the Belgian data, contact the RMI (or KMI in Dutch) and BUY them. Thanks for the updates on the UK weather this month. I recall a comment/thread in early April highlighting the major difference of forecasts foe weather in the UK for May. Piers Corban said it would be extremely cold ( comparatively for May ) and the UK Met office said it would relatively mild. So it looks like PC has shown up the Met Office ( with all its super computers and fancy models) has won their “little” difference of opinion. No wonder the bookies will not take bets from PC anymore. The real issue with the adjustments isn’t whether they are justified or not. The problem is the opportunity they present to introduce confirmation bias, which is well documented in branches of science better known for their methodological rigour than climate science. Thankyou very much for assistance. In my file from BEST it really looks like data where scrambled. In the header they write that this should be temperature but i got really dissapointed. Again.. If you have the 2011 version of best data, is there any chance that I can mail you the BEST station numbers that im interested to see, and then you can mail me the data? Tonyb and Gail Combs: Thank you very much for your comments, and I think its extremelyinteresting with that Phil Jones quote you were discussing! Thankyou for link to the daily Dutch temperature data. And there are probably more. But these data appears to be a royal national secret. Moderator: Than you so much for help!! I sense “conspiracy” in your writings. Have you vistited the met office library in De Bilt? Not everything that is published in print is put online, because somebody has to do the work. In nearly every university library in The Netherlands you can find the publications of Aart Labrijn which contains all the data up to 1945 in print. 2 Labrijn, A. Overzicht van de in Nederland met behulp van instrumenten verrichte weerkundige waarnemingen in de 18e en 19e eeuw. Hemel en Dampkring, 40, 1942, p. 19-21. I am fortunate to live near the Met office in Exeter who have an excellent library AND archive where there are very many interesting things. Most work has not been digitised and for many reseachers if it has not been digitised it does not exist and is not used. I was also at the Library of Exeter Cathedral last week looking at anything that might relate to the climate of the 14th and 15th Century. Nothing whatsoever from there is online and unlikely to be for years. you can find a lot more data from Germany from the DWD site. They are constantly updating the timeseries. You can even find daily temperature data from Hohenpeissenberg beginning in 1781 and 8 more beginning before 1902. Quite a few start in ’36/’37 then some in ’47 and then in ’51. It is one of the least user-friendly sites I know about, but there really is a lot of information available. I would not think that your comment regarding corrections for altitude has much in it as far as the Netherlands is concerned since the Netherlands is rather flat. According to Wikipedia: . Not much altitude variation. The Netherlands is also not a sprawling country (say unlike Chile or Norway) so I doubt that there is much in the [latitude] comment either. you can do it right or do it wrong. your choice. I managed to get the huge BEST file from 2011, and then im chopping it up to around 20 files so its just a little easier to work with!! It looks good now. Frank, I have downloaded 14,527 “Average annual climate values” pages from TuTiempo. It is a challenge to convert data found in them to csv format, because it is real nasty convoluted html, but it will be done and be made available to all. I do not think climate data could be copyrighted in a sane world, especially not at this stage of the climate debate. Absolutely Brilliant Péter Berényi, thank you. There are unadjusted and strongly adjusted values in one big pile and this is the challenge with this material. But several records here – even though often just a few years are made available before 1950 – are simply unique, you cant dig it up elsewhere. Again, thank you so much I wil really look forward to see what you have got. As it is now, its a very slow process to browse tutiempo. Take a look at Steve Goddard’s site he has some US graphs that tell the same story. Major changes to NH and US temp records in the 40-50’s time frame. This is criminal. Hi Frank, I had to restart the download from TuTiempo with a wider scope, because it turned out they publish data for the U. S. of A. in a different structure (by states within country) than for the rest of the world. I am not sure I will not be banned from the site due to overuse before it is finished. If not, the additional benefit is that now daily resolution is also included, even if it makes the download huge and time consuming. Anyway, scripts for extraction of annual data are ready (rather ugly one liners). As soon as I have the download finished, I will upload stuff to some place and leave a link to it here, so check back please later. It will be in tsv format, because some station names happen to contain commas. For extraction of finer resolution (monthly or daily) data some more work is needed. I am not sure yet when could I get back to it. The worst case scenario is that we will have only non-US data at annual resolution for some 9000+ weather stations. The rest of stations may have data for some months in several years, but never enough to calculate annual averages. I gave some more thought to the copyright issue. I really think all climate data should be in the public domain by now, because actual policies are based on them, which imply either direct or indirect taxation (boosting prices by overregulation). Therefore if some dataset happen to be copyrighted, states participating in the IPCC process (especially the EU, US, Japan & China) have to be compelled by joint political action to pay for it to the owner(s) to have them in the public domain once and for all, then publish them on the web in a standard, easy-to-process format. The same goes for the entire scientific literature on “Climate Change”, including the source code and full documentation of all computational climate models referenced in IPCC reports. This money would only be a tiny fraction of what’s currently thrown to the wind anyway. You have a small typo there Frank; that should be “one full Kelvin of heating”; not one full Kelvin of heat. Temperature (Kelvins) IS the correct measure of “heating”. either way…as long as your results match those approved by the polit bureau. Im very much looking forward to see your creation one fine day, super. Mosher: You did not right or wrong: You just didnt. Frank you can either adjust for lapse rates doing things the right way, and discover that the adjustment is small. Or you can ignore doing things the right way and claim it doesnt matter. You honestly don’t need so many stations. Initially when I found missing data for certain months or if a month’s data was based on less than 15 days of data, I put in the longterm average of that month.I later found out that that was a mistake because weather patterns follow cycles. 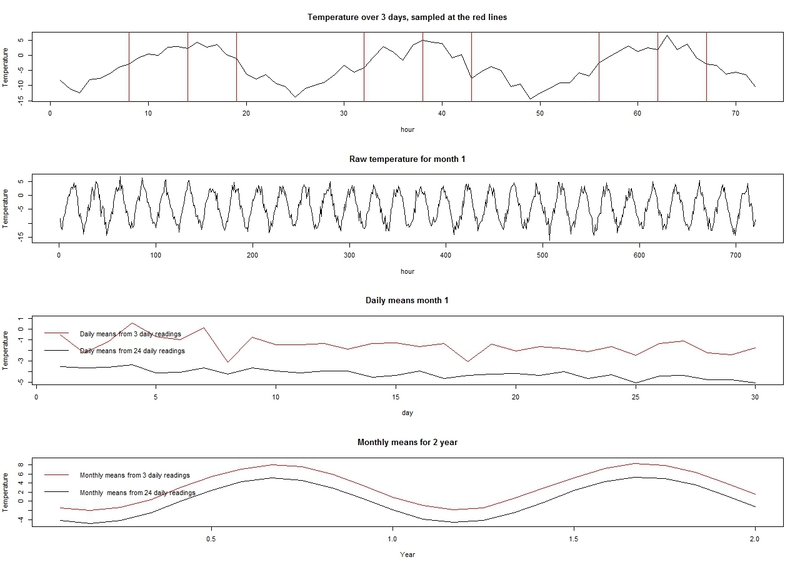 Subsequently, if I found a month’s data missing or if I found that the average for a month was based on less than 15 days of that month’s data, I looked at the average temperatures of that month of the preceding- and following year, averaged these two figures, and in this way estimated the temperatures of that particular month’s missing data. Note that instead of the means (average daily temp.data) I got more useful information from the maximum temperatures – which can be more directly related to the decline of the heat coming from the sun. 0.0455 ln (x) -0.1273 , r2= 0.997. The frightening aspect, if this relationship holds true, is that maxima would now be dropping at about 0.2 degrees C per annum already. Earth average temps. has been able to hide this from us because it stores energy in the oceans and in vegetation, also in hydrological cycles and in the weather. However, it seems from my tables for means and minima that this store may be running empty. So we might be in for a shock soon. I predict this year will be year where we start to see average temps. dropping quite dramatically. Nevertheless, average temps. is not a good parameter because it will give us the information that we need too late…..
We should be putting some alerts now, before it is too late. Mosher, its so simple: In the climate debate the validity of adjusted temperature data is questioned. IN-data for BEST are very afoten adjusted data. Therefore BEST is useless. Your job should have been to challenge these data, obviously. 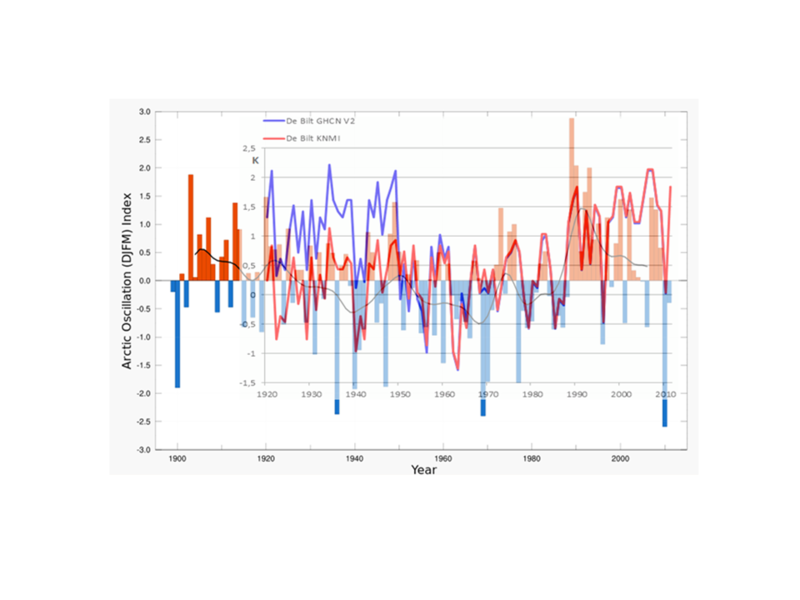 Mosher, its so simple: In the climate debate the validity of adjusted temperature data is questioned…. Mosher’s job is to defend the adjusted data so do not expect him to ever move from that position. As a lab scientist, adjusting data, ESPECIALLY adjusting data with no calibrations to back up the reason an adjustment is necessary is a really big NO NO. You just do not adjust data. As I said before you use error bars and foot notes with explanations. Just for the intellectual exercise. If the move to Stevenson screens introduced a known bias, the correct method would have been to run the old station along with the new Stevenson screen station for at least a year to determine the bias for that longitude and latitude and elevation and time of year. I find it very difficult to believe the adjustment is the same whether you are in Alaska or Siberia at 3,000 ft elevation in the winter and in Israel at 100 ft elevation in the summer. I really doubt that the bias would be the same for two stations at the same longitude and latitude and elevation that are on opposite sides of a mountain range. We have certainly seen enough raw temperature data to know that an observation based method for bias correction was never done for most stations. As in the Australian data, most of the measurements were rounded or truncated to the nearest degree. Anthony’s Surface Station Survey shows the stations generally do not meet the written standard. …An independent audit team has just produced a report showing that as many as 85 -95% of all Australian sites in the pre-Celsius era (before 1972) did not comply with the BOM’s own stipulations. The audit shows 20-30% of all the measurements back then were rounded or possibly truncated. Even modern electronic equipment was at times, so faulty and unmonitored that one station rounded all the readings for nearly 10 years! …. Therefore the older temperature data has error bars of at least 0.5 to 1 C minimum. This kills the “Earth is Warming” manta because the “warming” is within the noise of the error bars. Yes, and in the mean time another fish is in the net. Ok, more like 0,6 K.
Eh, it’s a bit more than I’ve bargained for. 8.9 GB, 360,951 files so far, still coming. Are you here for a rel dialog, then im “in” . You want to play smart and then run away before it gets too hot, I dont want to waste my time. You have not understood the issues mentioned in this article, its you choice if you want to expand your horizon, just let me know. wrong. you can go back and look at my comments since 2007. from the start I have had the following issues. rather than attack adjustments as a knee jerk reaction I suggested that one try to understand them, quantify the potential bias/uncertainty they add, and get the code. That’s what I have done. In addition, I’ve argued that investigating a different approach ( slicing records at change points ) will eliminate the need for adjustments. I made this argument. Willis made this argument, a number of us at the Airvent made this argument. organizations that compile the data. the uncertainty due to adjustment ( standard error of prediction) into the final answer. That is why I prefer a method like berkeley which uses unadjusted data. 4. Uncertainty. always interested in that. Peter: Thats odd with the 9 gb file: For ex even the “multi-file” of BEST is just 2 gb… ?! I really hope you find out somthing, that you can download as much as possible. Its not the process thats the issue, its the input data. Cherry picked periods, cherry picked stations, heavily adjusted data. Therefore even though Berkerley has some good approach, even sharing input data (GOOD!) it is still no better than intput data. Apropos the present article: Check Belgium and Northern France data raw before 1950 in the multi file. Check the Choice of danish stations. Dutch stations are mostly the adjusted ones.